On the one hand you say you “… all know how MQA files/music is produced”, on the other hand you want me to provide you with basic evidence of how software and digital works. The “English” that is confusing is the MQA marketing speak thrown into a basic ignorance of how digital works. You probably thought that there was something to “end to end”, white glove treatment of the MQA sells narrative…nope. It’s not about trust or the man - that’s what MQA is about, the audiophile sells game. We all know how MQA files/music is produced. As seen, not all MQA releases are treated the same. Some are given “white glove treatment” which takes maybe a year; others are given a remaster proven by comparison to non-MQA releases - Donald Fagan’s Night Fly is an example (not sure how long remasters take) and still others seem to be the same mastering as other existing releases just in the MQA fold. However they are produced, the final files are run through a conversion process that can probably be batched. There are some recordings which are being given the “white glove” treatment, you can read about the lastest project here: https://www.mqa.co.uk/professional/whiteglove The last page is the timeline, I think it was 8 or 9 months from true working on the tapes to final production. I would imagine a remaster takes some time as well, maybe not as long as the white glove treatment. I think some were making the argument, that given the number of albums/tracks released there is not enough time or manpower to generate them without some type of batch processing being employed. Certainly, not every MQA release was given the “white glove” treatment, or, even a remaster. So, probably most of them were batched. It makes sense to me. Especially, in recent pro-tools produced content that is locked to 24/48 or 16/44.1 from the beginning. OK, since you’ve made a nice little compendium of MQA marketing claims, here’s some of what’s problematic with them, to the best of my knowledge. As should be clear, I’m not a believer, and I also think the time has past to be respectful of MQA Ltd and its principals, or polite about what they’re doing. I’m also not an engineer, so please defer to the proper authorities or deities, depending on your preferences. Because by being lossy (more on that later), it doesn’t fit Meridian’s own definition of HiRes, which is “Lossless Audio that is capable of reproducing the full range of sound from recordings that have been mastered from better-than-CD quality music sources”. Yes, this is pedantic, and using Meridian’s definition of HiRes to take potshots at their own product is petty, but you know what ? I’m not the one shoving my proprietary format up and down people’s orifices. You also need to keep in mind that “lossy” and “lossless” have a meaning in this context, and that meaning is emphatically not “audibly lossless”. Well-encoded 320 mp3 is “audibly lossless”, at least as far as can be proven. I’m not saying this to compare MQA to mp3, but because they’re both “lossy” in the meaning that is used in audio. If MQA was “lossless”, you could take an MQA file made from a super high-res master (say, 256 DSD), and re-create that exact master, to the bit, from it. This is not possible, therefore MQA is “lossy”. It also isn’t “lossy” in the way that downsampling that FLAC would be lossy if you downsampled that DSD file to 24/192: FLAC could spit that 24/192 file back out, exactly, and to the bit. MQA cannot do that, and therefore, it is “lossy”. This is not “opinion”, this is demonstrable fact (and it’s fine, as long as you and I can agree that marketing departments don’t get to change the meaning of words). This might be a language barrier issue, but nope: if you were correct, then any and all 24/192 capable DACs would play MQA at up to their max resolution (say, 24/192), and you’d need an MQA dac for anything beyond that. In reality, non-MQA capable DACs that aren’t driven by MQA-licensed software such as Roon or Tidal play the so-called “folded” file at sub-cd quality. If there’s MQA-licensed software, they’ll play back at the maximal resolution of MQA, which is 18/96 if memory serves, and if the dac itself is MQA-licensed, then they’ll interpolate up to heaven-knows-where, using god-knows-what filters. If you’d like an extensive discussion of this by a superlative engineer who is critical of MQA, John Siau has you covered (in case you were wondering, he’s the guy behind the best dac and amplifier Stereophile ever measured, if someone wants to discuss the taxnomical differences between of measurers and listeners, please be kind and find a more interesting question to answer in life, like what makes the sky blue or something). Possibly, but not necessarily. There are other ways to achieve the same bit depth as MQA, as @Miska explains right here. That it’s technically feasible without the downsides of MQA brings us to your next point, which is the authentication. ‘‘MQA is about DRM’’ but then quality wise for the consumer. If the original is not 24/192 but an upsample it will not play as MQA. So you have been scammed. @Crenca already addressed this, when he said MQA’s authentication was mediocre. What BS is selling is of course alluring, the thing is that the real world has a way of not always getting along with marketing. In this case, there are two separate issues. It’s possible to mess with authenticated MQA files with data that doesn’t belong there, and still get the signal to come back as authenticated. Read this if you’d like more details. MQA consists of “hiding” the hi-res information in the inaudible range, so it is hires and not limited to the audible limit of man as the current music is limited based on the Nyquist frequency. Well here’s where my pettiness from before comes into full bloom, and I turn your arguments from authority against you: if Bob Stuart, CEO and founder of Meridian gives a definition of HiRes that doesn’t fit that of Bob Stuart, inventor of MQA, who are you to declare it “HiRes” ? If Bob Stuart himself declares that MQA comes from science that’s “post-nyquist”, who are you to declare that science to be irrelevant ? Of course, you and I can possibly agree that the hearing mechanism of birds is irrelevant to HiFi, but then you’d have to also agree with me that it’s possible that MQA Ltd is taking you for a ride. As this link I’d suggested you look into before explains, this is still possible. But I’d understand that you’d consider doing something like that to be bending the rules, and that no self-respecting music industry exec would do anything that vile, and also that both MQA Ltd and Bob Stuart are too honest, and have too much at stake to do something that disgusting to consumers. Well, let me tell you a little not-quite a secret. The “Like A Virgin” album according to the producer Nile Rodgers was recorded on a Sony 24-Track PCM 3324 DASH digital multitrack, through an SSL E-series console, and mixed to a Sony PCM F1 two track 12-bit deck. See the end of that sentence ? “12-bit deck” ? Aha ! you say… but that PCM 3324 was 16/44 (or 48) ! To which I’d say fair enough, the best that performance was recorded at is 16/44, so it can conceivably be remastered at 16/44. Why am I ranting and raving about Like A Virgin minutia ? Well, given that we already agree that “If the original is not hires, it will never be hires by MQA”, and that you believe what MQA Ltd. and Bob Stuart have been telling you about authentication, how would you feel about Bob Stuart if I sold you an officially released, 24 bit, 192khz MQA-authenticated, recording of Like a Virgin ? How would you feel if BS himself told you that the MQA was made in some super-duper special fashion, worthy of being the flagship in the Master Quality Authenticated, Provenance Series ? That he, himself, would guarantee you that the precious waves had been massaged like the finest Kobe beef, using only the best sake ? And that some of the stuff on his version came from an analog recording, impervious to the nastiness of early digital, and that that’s why his version is so fully deserving of being presented in MQA ? And now, how would you feel if some evil, cynical, anonymous doubter came along, and compared that super-special flagship version with another that was available earlier, and it turned out there was, well, almost no difference at all ? What if his observations included the words “We basically see a steep frequency cut-off just past 20kHz” ? A “steep cut-off” just past 20kHz doesn’t sound like a whole lot of 24/192information, now does it ? And yes, of course, it’s entirely possible that there are multiple MQA versions of Like a Virgin, and that’s the kindest explanation to what’s going on. But even then, how would you know which to trust ? Isn’t the whole selling point of the blue light to take that doubt away from you ? Now that you know this about Like a Virgin, would you maybe feel like you were… hoodwinked ? Or, like a virgin in the wonderful world of audio fraudsters, maybe something else, with fewer letters, that might also end with “-ked” ? Would you still trust that blue light, and the sultry words of the suave englishman ? I’m not entirely certain how this is relevant at all, but, hey, if you’ve got a data encapsulation fetish, to each their own. As far as I know, official “end to end” MQA requires the original recording to take place in an MQA certified recording environment. Until then, it is all just applied processing. Part of the “let’s through this software encoding/“end to end” concept at the all and see what sticks” mess of what was and is MQA’s ‘plan’ is it not. Were they positioning themselves to be a mastering outfit? What is “certification”, exactly, given that non-disclosure is essential to all that MQA is? Were they positioning themselves as a kind of post processing, DSP, batch processing software encoding outfit from the beginning? That is what they have in fact become. The shift happened pretty early when they realized that there only real hope at any market share was through streaming. I think that indeed they want to be part of the recording process. That is where the “we can fix the problems based on the individual microphone used” came from. Musicians record with known approved microphones so that their individual known idiosyncrasies can be corrected. There’s a Stereophile piece that quotes BS as essentially stating his timeline to get the world’s entire music catalog to MQA is in months. Spotify’s catalog is mentioned, and he’s all “nah, Spotify pooh-pooh, we want to give the consumer everything, in MQA”. Napkin math, Apple Music’s 50 million tracks, Spotify is 35 million, the average length of a track is 250 seconds, 50 million times 250 is 12500000000, there’s 31557600 seconds in a non-leap year, encode in real-time, and you’re talking something like 400 years if I’m not mistaken. So either BS is full of it with his roadmap, they’ve got a LOT of engineers on payroll (which if they do would be an order of magnitude bigger than what’s in their filing, something I’m certain British authorities would be interested in), or they’re doing batch. None of these are mutually exclusive, of course, but some make a whole lot more sense than others. Also, since I might as well be petty, this simple math should give you all the information that’s necessary to assess the quality of reporting at Stereophile. John Atkinson admitted on the “MQA is Vaporware” thread that it was this idea of a “Master of the mastering process - ‘end to end’” that was the context of his infamous “present at the birth of a new world” statement. In other words he also denies, in his own way, that MQA was ever about an innate/algorithmic sound quality improvement (i.e. so called “blurring”), rather about the most important aspect of sound quality - recording and mastering circumstances. Of course, he does not have Robert Harley’s (editor of The Absolute Sound) insight into what MQA is really about for the labels: DRM. Or start listening to MQA properly, rather than just speculating on what it does indeed sound like when it’s processed properly through both unfolds, and an MQA DAC. The guy uses a Schiit Gungnir multibit DAC, and therefore has no credibility as far as listening to MQA properly is concerned. Well, given that we already agree that “ If the original is not hires, it will never be hires by MQA ”, and that you believe what MQA Ltd. and Bob Stuart have been telling you about authentication, how would you feel about Bob Stuart if I sold you an officially released, 24 bit, 192khz MQA-authenticated, recording of Like a Virgin ? Napkin math, Apple Music’s 50 million tracks, Spotify is 35 million, the average length of a track is 250 seconds, 50 million times 250 is 12500000000, there’s 31557600 seconds in a non-leap year, encode in real-time, and you’re talking something like 400 years if I’m not mistaken. If you do this one by one you are right, I assure you they don’t. Oh ye of little faith, I hope you perused the exquisite words of HiRes™ Audio©’s lord and saviour, where he explaineth to his flock how from the ancient master tape, he moulded a splendid rendition of the original, limitations of the master tape or independent null tests be damned. Mp3 is Lossy. 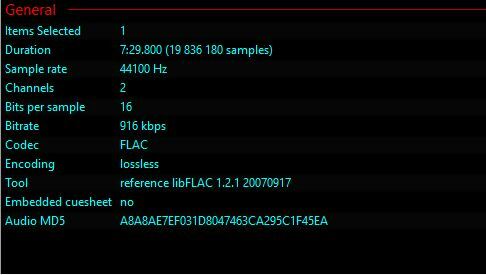 Flac for example is lossless, Or does foobar misinterpret this also. If you take file_1.wav, encode it into file_1.mp3, encode that into file_1.flac, and make that .flac into file_2.wav you’ll have a lossy representation of the original file_1.wav, because of the file_1.mp3 step. Both MQA and Mpeg Layer 3 are “lossy”, and both can be “perceptually lossless”. It took quite a bit of pushing and prodding, but BS is on the record saying it for MQA, and then spinning that into “perceptually lossless” to confuse non-technical users. Another way to think about it is, which may be less offensive to the fragile of heart than comparing MQA to .mp3 is that, if you remember, one way to test if your computer was outputting bit-perfect data was to play back a movie track. Both AC3 and DTS are lossy formats, but to be able to decode them, you still need to transport that lossy stream without changing anything to it - so, well, losslessly.